Japan's Ambassador to India, Kenji Hiramatsu speaking at the 75th anniversary event of the Battle of Kohima here on Thursday. 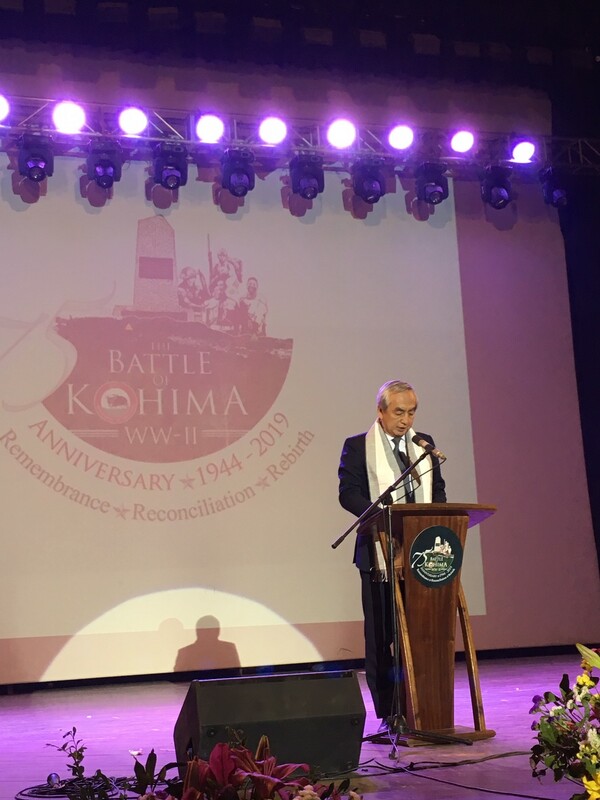 Kohima [Nagaland], Apr 4 (ANI): Japan's Ambassador to India Kenji Hiramatsu on Thursday said that the Battle of Kohima was etched in "our hearts as one of the fiercest and toughest battles" during the Second World War. "It took a toll on thousands of precious lives of the Indian National Army, the British Commonwealth Force, and the Japanese Army," he said, speaking at the 75th-anniversary event of the Battle of Kohima. Chief Minister of Nagaland Neiphiu Rio, Sir Dominic Asquith, High Commissioner of the United Kingdom, and other dignitaries were also present on the occasion. Japanese envoy Hiramatsu also offered his heartfelt prayers to the fallen souls while appreciating the opportunity presented by the event for reconciliation. Renewing Japan's commitment to never repeat the devastation of the war, Hiramitsu said: "The people of Nagaland and its neighbours, including Myanmar, had to endure severe sufferings and pains. We should never forget that the peace we enjoy today is built over such tremendous sacrifices." "Squarely facing the history of the past, Japan renews its commitment to never repeat the devastation of the war. We look back, in order to look towards the future." The envoy further said, "Genuine reconciliation is only possible through dedicated efforts by us all. I would like to pay a special tribute to those who have dedicated themselves to such tireless struggles for reconciliation over these long years. Now, the relations of countries which once fought with each other have been transformed for the good." "Japan currently enjoys relations at their best with India, the United Kingdom and the United States. I am grateful for the true partnership and friendship we have nurtured over the decades. Moreover, the relationship between Japan and the North Eastern region, including Nagaland, has become substantially closer." Looking towards the future, Ambassador Hiramatsu reiterated his commitment to pursue stronger relations with India’s North East, including the State of Nagaland, through such means as the people-to-people exchange. He also talked about Japan's IRIS progamme and invited youth from the state to participate. "Japan attaches great importance to people-to-people exchanges, in particular among the youth. The youngsters will shape our future, and there can be nothing more rewarding than investing in them. Japan has been implementing the IRIS program for two years now, inviting young Nagas and other youths from the region. Japan is also willing to welcome people from the North East through the Technical Intern Training Program as, for example, apprentice care workers," he said.